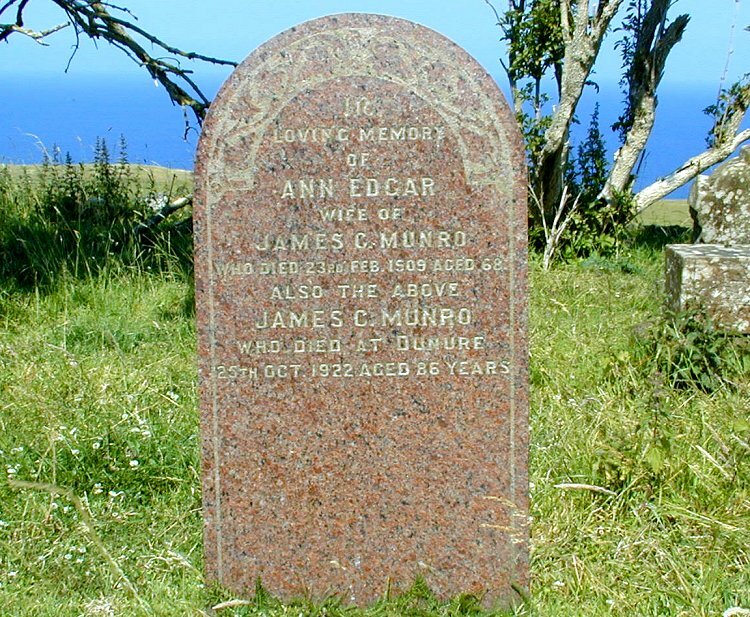 In loving memory of ANN EDGAR wife of JAMES C. MUNRO who died at Dunure 23rd February 1909 aged 68. Also the above JAMES C. MUNRO who died at Dunure 25th October 1922 aged 86. 1. James MUNRO was born about 1811 in Maybole, Ayrshire. He was a Fisherman. +2 i. Mungo MUNRO (born about 1832). +4 iii. James (C.) MUNRO (born on August 8, 1836). +6 v. Alexander MUNRO (born about 1843). 1879 aged 46. Also their brother DAVID who died 10th April 1902 aged 23. 10 i. Elizabeth MUNRO was born on January 10, 1858 in Parish of Maybole, Ayrshire. 11 ii. Grace MUNRO was born about 1862 in Fisherton, Ayrshire. She died on November 29, 1941. She was buried in Dunure Cemetery. 12 iii. John MUNRO was born on February 19, 1865 in Fisherton, Ayrshire. He died on September 17, 1955. He was buried in Dunure Cemetery. +13 iv. Jane MUNRO (born on April 22, 1868). 14 v. Janet MUNRO was born on September 6, 1870 in Fisherton, Ayrshire. +15 vi. James MUNRO (born on April 30, 1873). +16 vii. William MUNRO (born about 1876). 17 viii. David MUNRO was born about 1879 in Fisherton, Maybole. He died on April 10, 1902. He was buried in Kirkbride Churchyard #48. 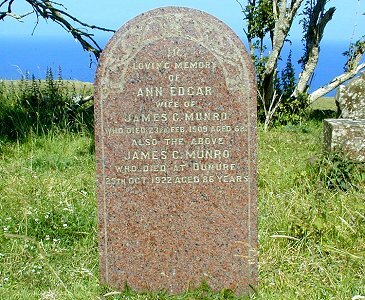 EDGAR wife of JAMES C. MUNRO who died at Dunure 23rd February 1909 aged 68. Also the above JAMES C. MUNRO who died at Dunure 25th October 1922 aged 86. +18 i. Mary MUNRO (born on December 12, 1866). +19 ii. Margaret MUNRO (born on February 8, 1869). 20 iii. James MUNRO was born about 1879 in Dunure, Ayrshire. 6. Alexander MUNRO (James-1) was born about 1843 in Parish of Maybole, Ayrshire. He died on February 20, 1910 in Dunure, Maybole, Ayrshire. 11 He was a Fisherman. He was buried in Kirkbride Churchyard #45. +21 i. John MUNRO (born on December 13, 1870). 22 ii. Mungo MUNRO was born on March 19, 1873 in Dunure, Maybole, Ayrshire. 23 iii. Jane J MUNRO was born on July 25, 1875 in Dunure, Maybole, Ayrshire. 24 iv. Margaret MUNRO was born about 1877 in Dunure, Maybole, Ayrshire. She died on July 12, 1940. She was buried in Dunure Cemetery. 25 v. James MUNRO was born in 1880 in Dunure, Maybole, Ayrshire. 26 vi. Thomas MUNRO was born about 1896. He died on December 29, 1959. He was buried in Dunure Cemetery. +27 vii. Georgina McKie MUNRO (born about 1901). 13. Jane MUNRO (Mungo-2, James-1) was born on April 22, 1868 in Fisherton, Maybole. She died on December 25, 1938. She was buried in Dunure Cemetery. Samuel WRIGHT was born about 1865. He died on August 10, 1943. He was buried in Dunure Cemetery. 15. James MUNRO (Mungo-2, James-1) was born on April 30, 1873 in Fisherton, Ayrshire. He died on December 28, 1934 in Rosebank, Dunure. He was buried in Dunure Cemetery. 28 i. Davina MUNRO was born in December 1916. She died on February 19, 1919. She was buried in Dunure Cemetery. 16. William MUNRO (Mungo-2, James-1) was born about 1876 in Fisherton, Ayrshire. He died on February 18, 1934 in Rosebank, Dunure. He was buried in Dunure Cemetery. 29 i. Elizabeth Walker MUNRO died IN INFANCY. 18. Mary MUNRO (James (C.)-2, James-1) was born on December 12, 1866 in Dunure, Ayrshire. She died on March 2, 1948 in 20 Kennedy Drive, Dunure. She was buried in Dunure Cemetery. John GRIEVE (son of John GRIEVE and Agnes(s) HAY) was born on February 16, 1864 in Parish of Inch, Wigtownshire. He died on January 13, 1934 in The Sheiling, Dunure. He was a Fisher (1881). He was buried in Dunure Cemetery. 19. Margaret MUNRO (James (C.)-2, James-1) was born on February 8, 1869 in Dunure, Ayrshire. She died on October 16, 1948. She was buried in Dunure Cemetery. 30 i. James Munro GIBSON was born in 1890. He died on June 13, 1953. He was buried in Dunure Cemetery. 21. John MUNRO (Alexander-2, James-1) was born on December 13, 1870 in Dunure, Maybole, Ayrshire. He died on March 11, 1952. He was buried in Dunure Cemetery. Grace ANDREW (daughter of William ANDREW and Margaret Marion McCRINDLE) was born on January 2, 1871 in Dunure, Ayrshire. She died on April 13, 1935. She was buried in Dunure Cemetery. 27. Georgina McKie MUNRO (Alexander-2, James-1) was born about 1901. She died on August 11, 1957. She was buried in Dunure Cemetery. 32 ii. Jean BOYD . 1. Old Parish Registers of Maybole PAGE: Frame 1013. 2. Old Parish Registers of Maybole PAGE: Frame 798. 3. Old Parish Registers of Maybole PAGE: Frame 847. 4. Old Parish Registers of Maybole PAGE: Frame 919. 5. Old Parish Registers of Maybole PAGE: Frame 968. 6. Marriage Certificate #4 of 1856 at Maybole, Ayrshire. 7. Old Parish Registers of Maybole PAGE: Frame 797. 8. Old Parish Registers of Maybole PAGE: Frame 823. 9. Marriage Certificate #5 of 1866 at Maybole, Ayrshire. 10. Old Parish Registers of Kilwinning PAGE: Frame 963. 11. Death Cerificate #18 of 1910 at Maybole, Ayrshire. 12. Old Parish Registers of Kirkmaiden by Drummore, Wigtownshire PAGE: Frame 438.